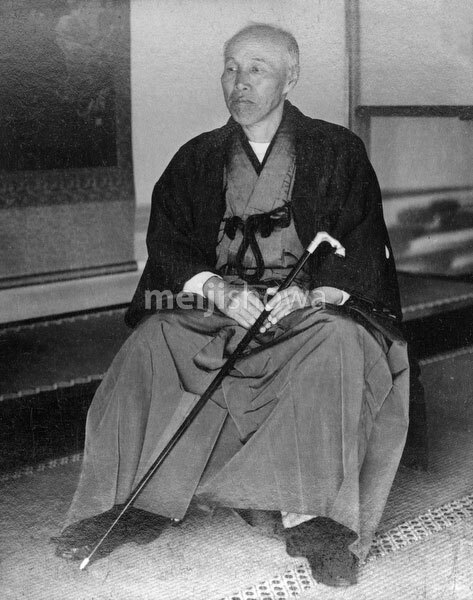 Japanese statesman Shigenobu Okuma (大隈重信, 1838–1922) at his home in Tokyo in 1903 (Meiji 36). Okuma was the 8th and 17th Prime Minister of Japan and an early advocate of Western science and culture in Japan. In 1882 (Meiji 15), Okuma co-founded the Constitutional Reform Party (Rikken Kaishinto). In the same year he also founded the Tokyo Semmon Gakko. The school later became Waseda University. An estimated 300,000 people attended his funeral in Tokyo’s Hibiya Park. Strangely, he seems to be wearing shoes in-house.